I am sure we all have been asked, at one point or another, the dreaded “so, what is best practice” question by a prospect. For me, it's usually framed as "so, what do other customers do with this feature?" It is highly variable – a practice consists of both direct & indirect inputs, so while you may get insight into a particularly strong process or workflow, you are not capturing any of the variable inputs: tacit knowledge, enthusiasm of the employees, people with domain knowledge, teamwork, culture, etc. However there are some good reasons why people ask the “best practice” question. Usually it falls one of two ways: Either a customer is trying something new & want to “size” the work involved (e.g. “we want to automate our outbound lead generation activities – what is best practice in email marketing?” etc.) - questions help the assessment of options & alternatives. Alternatively, they may want to expedite a project based on 'known knowns'*: Why reinvent the wheel when we know that 'X' MUST be done anyway (e.g. “I know I can’t do lead generation if I don’t have a list of contacts in a system somewhere – what is a best practice for getting me started?” etc.). Number 1 requires a definition – that is to say, ground an assessment within a set of parameters. Otherwise you cannot progress with steps 2 or 3. 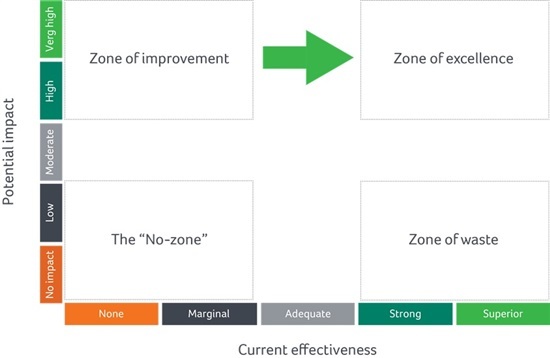 One definition I heard from an old colleague which has stuck with me is that 'best practice is where optimum effectiveness meets maximum impact'. Or, to put it another way: if you do something really well & it produces a great result, then you are doing something close to the best practice. Number 2 is trickier, for the 3 reasons mentioned earlier. Here is a suggestion to help: Create a list of key inputs into the best practice you are analyzing. Then assign a 1 – 5 scorecard to each based on how “effective” & “impactful” they are (5 being the highest). The image below (an example which assesses marketing campaigns) should help illustrate it that campaign verticals are a candidate for best practice, given they score high in effectiveness (4) and impact (5). Conversely, this company does product feature campaigns well (3) but the impact is low (1). So is it something worth investing in? Finally, let's look at number 3. This is where it should all come together. A simple chart (see the image, below) can help prospects visualize exactly where a “practice” sits on the effectiveness/impact scale**. By grouping a couple of categories together and "mapping" on to this chart, you have a powerful template for discussing best practice with a prospect. It may already exist in the company (credit where credit is due!) or there may be opportunities to get to best practice level. This should hopefully open doors for a Sage CRM pitch as the solution to those particular best practice challenges.